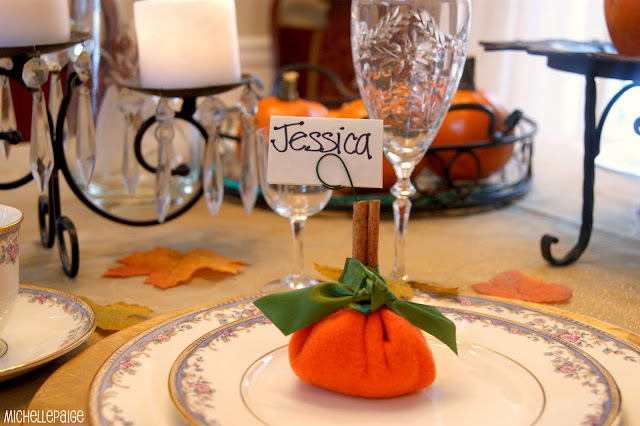 Need some place cards on your Thanksgiving table? 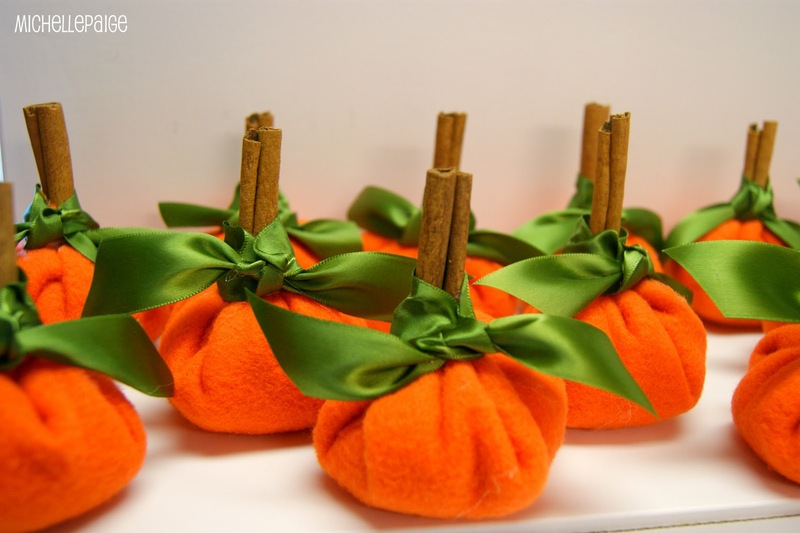 These little pumpkins are made from a Dollar Store blanket! They're a quick, no sew craft that you can whip up in no time. 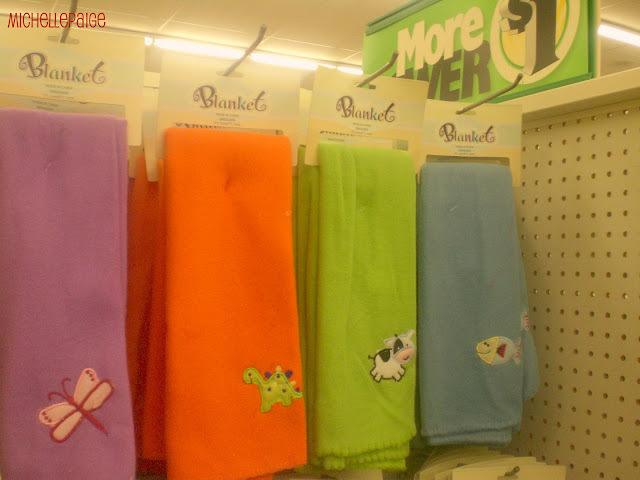 I found this orange fleece blanket in the baby aisle of the Dollar Store. The color was perfect for pumpkins! 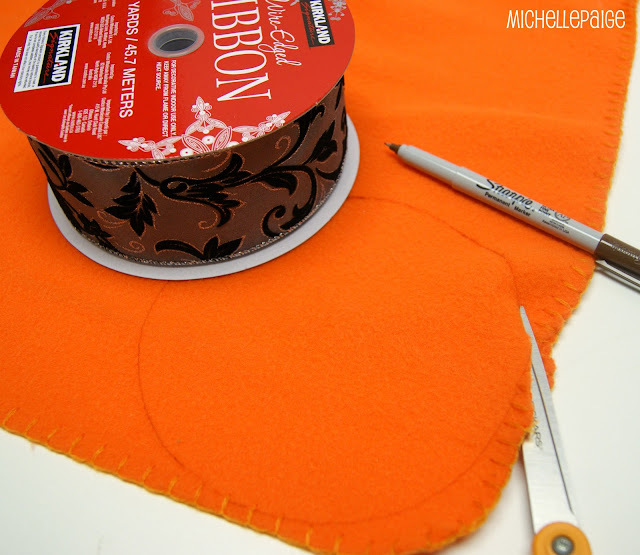 Using a circle shape like a plate, container or (in my case) a ribbon spool, trace the circle onto the fabric. (My circle measured about 5 inches across, but you could do any size.) Cut out the circle. 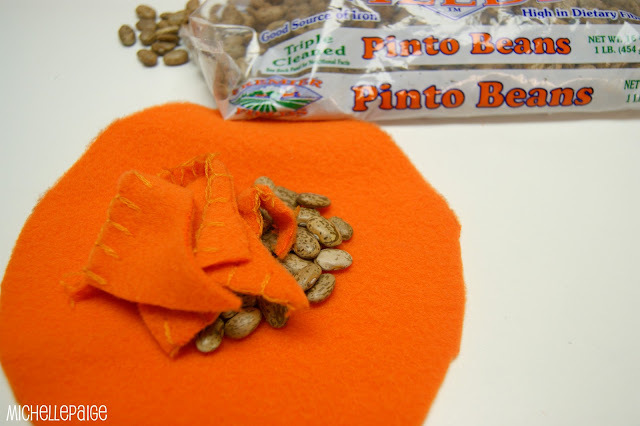 In the center of the circle, add about 1/4 cup of dried beans (also from the Dollar Store), and a few of the leftover scraps from cutting the circle out. Snap cinnamon stick to the desired length. Place the stick straight up in the middle of the circle. 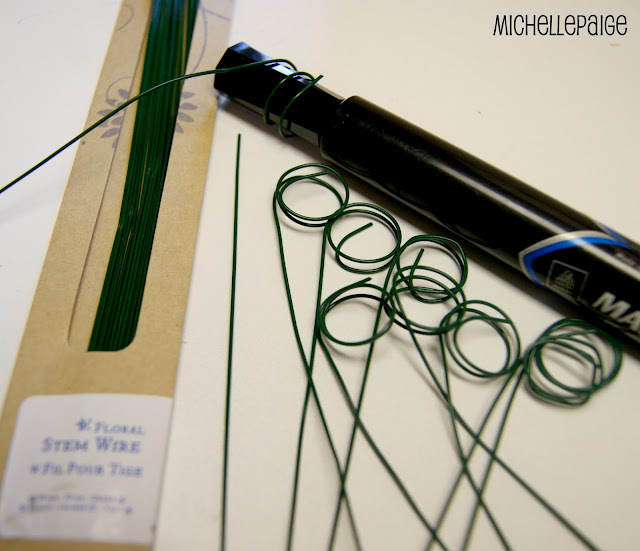 Gather the material around the stick and secure with a rubber band. Find some wide, green ribbon. Mine was leftover from this past project. 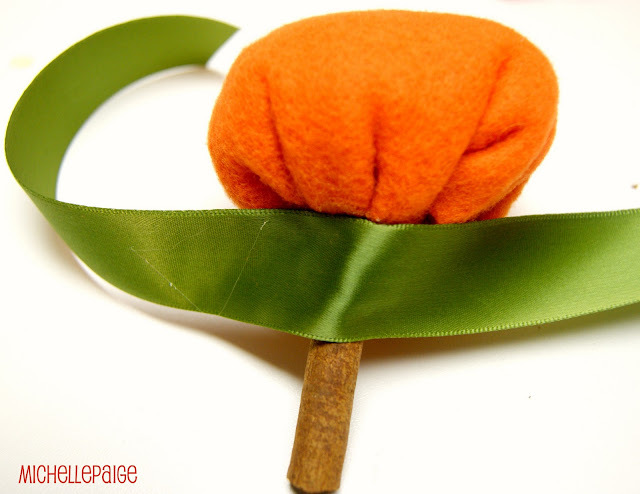 Using a glue gun, hot glue the ribbon around the cinnamon stick. Start in the back and work your way around to the front. 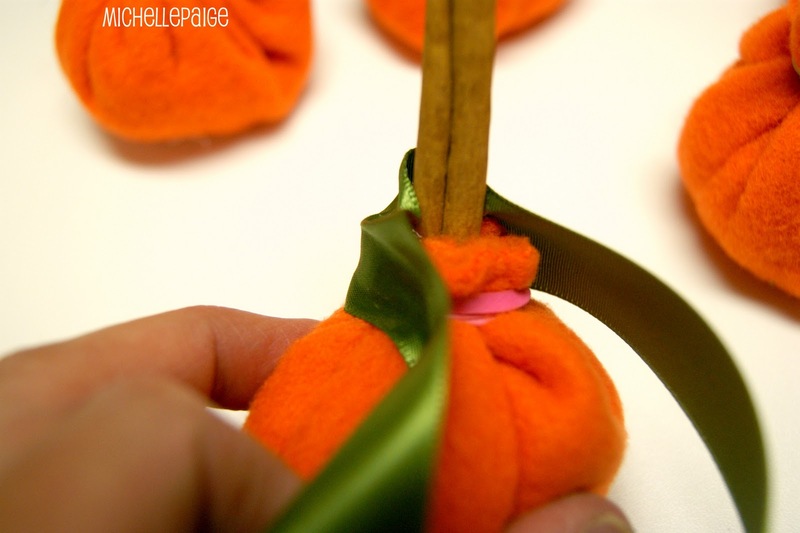 Glue the ribbon to cover the rubber band and the orange edges that are sticking out. Press firmly and hold...be patient. It will need to be scrunched up a bit to cover everything. Tie ends in a knot. or add a bit of wire to make a place card. and wrap the end a few times around a fat marker. 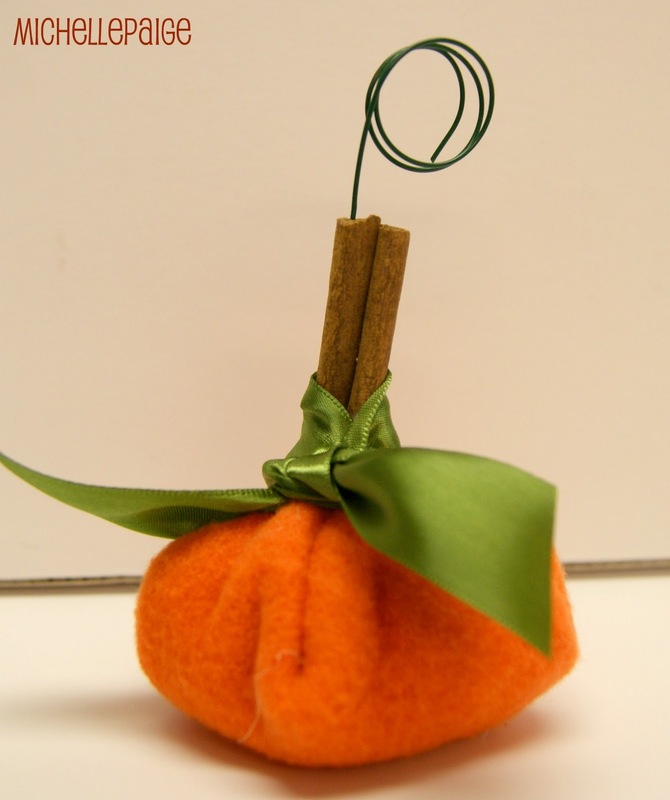 Trim wire to the desired height and stick into the cinnamon stick stem. The wire just stays inside the cinnamon stick...no glue needed. Add a name card...and you're finished. 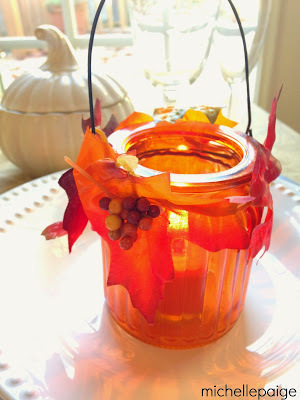 Just the perfect touch for the Thanksgiving table! 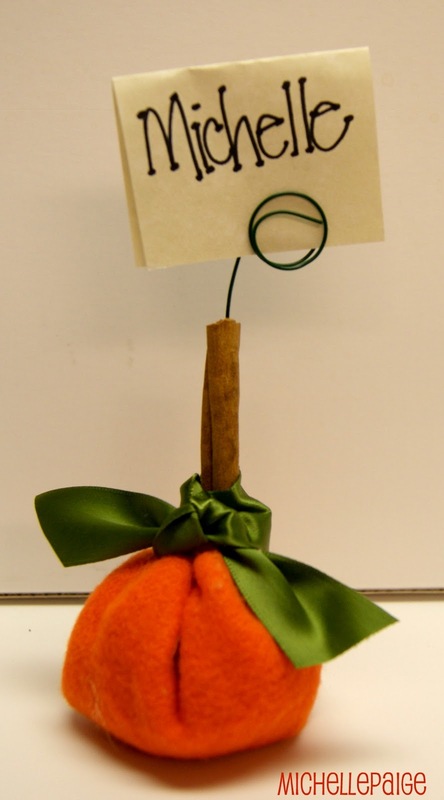 For another easy pumpkin idea- this time, made from sweaters, click here. Wow! Saw your post from Whipperberry linky party - this is a fabulous idea. Love it! Adorable Michelle! To cute! I may have to make those in my class next year! Love it! So lovin' this! I would have never thought to use the blankets! I would love for you to share these at our Home for the Holidays link party. They are awesome! This is such an adorable idea!!! Oh my goodness, those are just adorable! oh. my. goodness! Those are toooo adorable!! 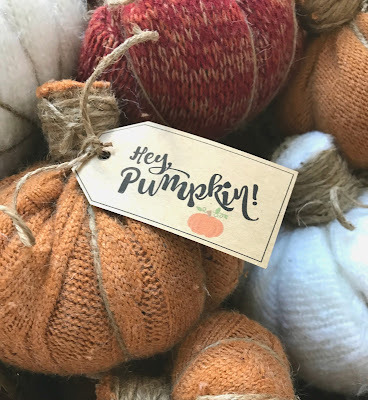 I made the bigger version of a no-sew pumpkin back in October, but I love these mini ones as placecards! The cinnamon stick is a cute touch, and they would look SO cute on the table. If we hadn't just made turkey placecards, I'd so be doing this! Pinning it anyway for next year! Would you share this here? Hi Michelle! Thanks so much for this idea. We made these at our girls Mary Kay/Holiday party today. Everyone loved them! 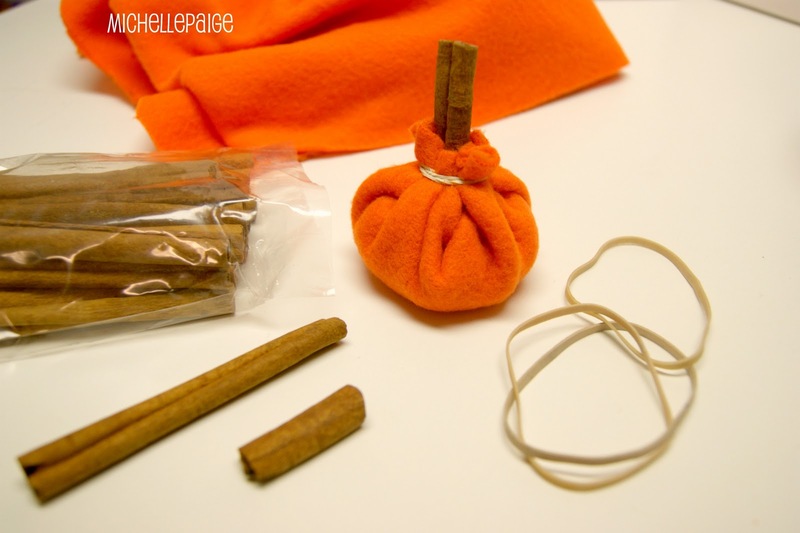 I posted about them here- http://havingkidsisfun.blogspot.com/2012/11/two-really-fun-crafts.html.